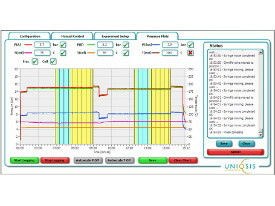 The Uniqsis Data Logger Software is an extremely useful accessory that allows reactions to be visualised and monitored graphically in real time. In addition to temperature and pressure traces, fraction collection can be displayed and coloured to show extended product collection regions that takes into account dispersion both before and after the main reaction plug. The data can be saved and exported in a standard tsv format for import into eLNBs or Excel etc. It is supplied pre-loaded onto a laptop and requires a serial connection (cables supplied) to your FlowSyn.